While trends show rising rates of obesity in the general American population, particular demographics experience even higher rates than the average. Obesity has been found to have significantly higher rates of prevalence among blacks, and Latinos/Hispanics. This in turn has led to higher rates of diseases and medical conditions that are linked to obesity in these populations. Looking at the chart, black and Hispanics have greater rates of obesity. Rates of obesity were particularly high amongst women in both those groups. 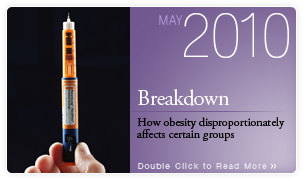 The increased rates of obesity in these populations have serious implications for the health of these groups as well. 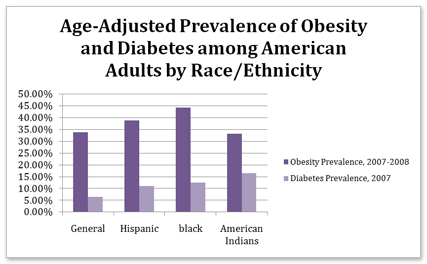 The chart also displays that among black, Hispanics and American Indians rates for Diabetes are above average. While these figures do not necessarily display a causal relation, they seem to imply some correlation, especially since type 2 diabetes is strongly connected with diet, which is certainly connected to obesity. Another consideration is the health risk that diabetes constitutes to one’s overall well-being: a person with diabetes has twice the risk of death compared to someone else who is the same age and does not have diabetes. In trying to explain the higher rates of obesity among these minority groups, there are multiple reasons that may explain some of the disparities. One is that different racial and ethnic groups can have different behavioral norms which influence weight gain, such as frequency of physical activity. Another is possible differences in cultural attitudes toward body weight. Lastly, access to affordable, healthful food varies by neighborhood. It has been found that in minority and low-income communities there are often fewer supermarket and produce store options, making them “food deserts.” As a result, in these neighborhoods healthful food tends to be more expensive in comparison to highly caloric, and widely available, “junk” food. Additionally, a recent study published in the journal Pediatrics that looked at childhood obesity found black and Hispanic children at a disadvantage. Taking into consideration more than a dozen of prenatal and early childhood circumstances that are believed to increase the risk of obesity, almost all of them were more frequently occurring among black and Hispanic populations in comparison to whites. The risk factors that researchers evaluated included mothers who smoked during pregnancy, unusually rapid weight gain in young infants, starting solid food prior to 4 months, mothers’ routinely pressuring young children to eat more, children sleeping less than 12 hours daily between 6 months and 2 years, and allowing very young children to have sugary drinks, fast food, and/or TVs in their rooms. Current statistics show 20% of black and Hispanic kids between 2 and 9 years old to be obese, versus 15% of white children. All statistics, unless otherwise stated, are from the Center for Disease Control and Prevention.